Cone was born in Kansas City, Missouri to Joan (née Curran) and Edward Cone. He attended Rockhurst High School, a Jesuit school, where he played quarterback on the football team, leading them to the district championship. He played summer ball in the Ban Johnson League. At 16, he reported to an invitation-only tryout at Royals Stadium and an open tryout for the St. Louis Cardinals. Upon graduation, he was drafted by his hometown Kansas City Royals in the third round of the 1981 Major League Baseball Draft. Prior to the 1987 season, Cone was traded with Chris Jelic to the New York Mets for Ed Hearn, Rick Anderson and Mauro Gozzo. Cone went 5–6 with a 3.71 ERA and 68 strikeouts in 21 appearances (13 starts) his first season in New York. Cone began the 1988 season in the bullpen, but was added to the starting rotation by the first week of May. His first start was a complete game shut out over the Atlanta Braves, as he went 9–2 with a 2.52 ERA in the first half of the season to earn his first All-Star nod. For the season, Cone went 20–3 with a 2.22 ERA to finish third in National League Cy Young Award balloting. Cone spent over five seasons in his first stint with the New York Mets, most of the time serving as the team's co-ace alongside Dwight Gooden while leading the National League in strikeouts in 1990 and 1991. In 1991, Cone switched from uniform number 44 to 17 in honor of former teammate Keith Hernandez. On August 30, he struck out three batters on nine pitches in the fifth inning of a 3–2 win over the Cincinnati Reds. He became the 16th National League pitcher and the 25th pitcher in Major League history to accomplish the Pitchers who struck out three batters on nine pitch/three-strikeout half-inning. 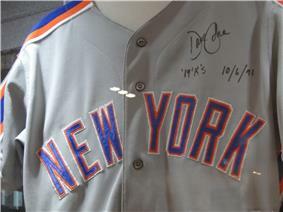 Cone's jersey from his 19 strikeout game on October 6, housed in the Mets Hall of Fame and Museum at Citi Field. Cone returned to his hometown Kansas City Royals as a free agent for the 1993 season. Despite an 11–14 record, Cone had an impressive 1993, pitching 254 innings with a 3.33 ERA, or 138 ERA+. He improved to go 16–4 with a 2.94 ERA (171 ERA+) in the strike-shortened 1994 season to win the American League Cy Young Award, and finish ninth in MVP voting. Cone was a Major League Baseball Players Association representative in negotiations with Major League Baseball in events that surrounded the 1994 baseball strike. 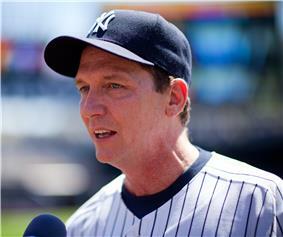 He re-signed with the Yankees for the 1999 season for $8 million. 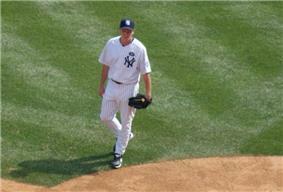 He went 12–9 in 1999, pitching the sixteenth Don Larsen. Larsen could be seen smiling in the press box after the final out was recorded. ^ Joseph Durso (October 7, 1988). "THE PLAYOFFS; Troubled Cone Stops the Press". ^ John Ed Bradley (April 5, 1993). "Strikeout King David Cone Hopes the News He Makes as a Kansas City Royal Will be About Baseball, Not Off-the-Field Shenanigans". ^ Harper, John (June 25, 2006). "Inside Scoop: Cone Loyalty Torn. Pinstripes Still Suit Him, But So Do Mets". New York Daily News. Retrieved May 14, 2012. ^ David Cone on Advanced Stats, the End of His Playing Career, and Riding on David Wells’s Motorcycle, nymag.com; accessed February 12, 2015. David and Lynn Cone later divorced and Cone is presently, as of 2015, engaged to Taja Abitbol. gave birth to a son, Brian, in 2006.